Close to 200 Cowley College students took advantage of the Late Night Breakfast offered at the McAtee Dining Center between 10-11 p.m. Wednesday, December 16. 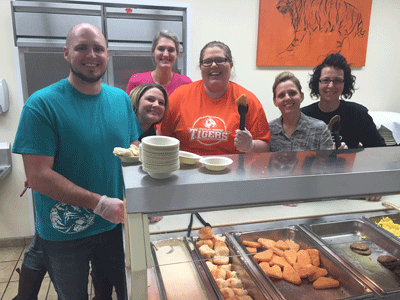 Ten Cowley College employees helped serve the Late Night Breakfast which was prepared by Great Western Dining. Those pictured are, from left, Landon West, Dawn Williams, Darshaya Gallard, Carly Brock, Kristi Shaw and Brooke Istas.